Teaching English Abroad: I Did It, You Can Too! "I quit my job to travel the world!" "Lawyer, early 30's, quits partnership to travel!" "CEO quits to travel full time." Sounds incredible, right? Chances are you have aspirational travel dreams but, higher chances, you are not a CEO or a partner in a law firm ready to leave and bank off that budget-cushion. As lovely as those headlines sound, they're not realistic or applicable to the majority. It was my final semester of college. I was a fine art major and was having one of my first, big, shows when one of my friends came to the opening and we began to chat about her future plans. She told me that she was leaving next month to teach English in South Korea. Immediately I was proud for her, excited, and ultimately intrigued. She planted the bug in my ear. How did she find out about this opportunity? And, more importantly, can I do it too? Of course you can~ I did. And here's how you can too! 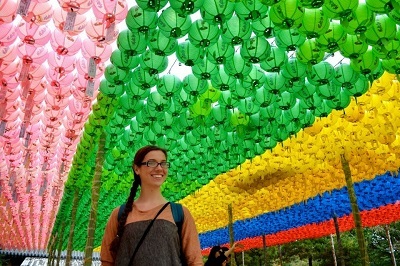 My friend, Claire filled me in on teaching English abroad in South Korea and before I knew it... I'd done the research and enrolled in an online TEFL course through International TEFL Academy. A TEFL certification gives you the background in grammar and classroom tools to teach English as a foreign language (TEFL). The course was informative, flexible, and ultimately over-prepared me for my duties while in Korea. 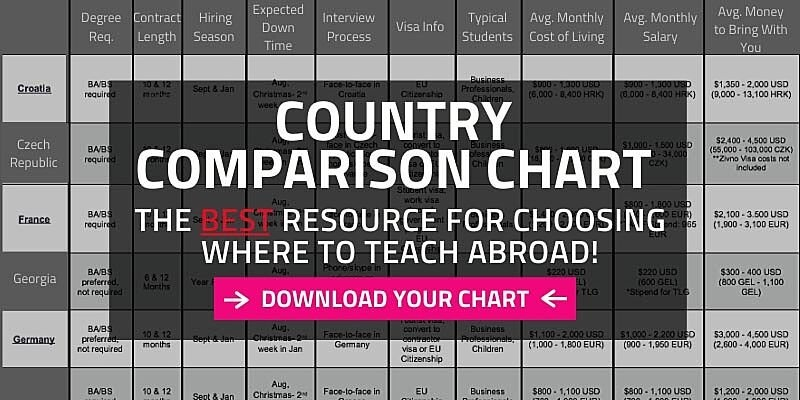 I compared prices, curriculum, and testimonials of other online certifications and International TEFL Academy was the best bet in my opinion. This accredited TEFL certification program is not strictly geared for teaching in South Korea; or even Asia for that matter. English teachers, with native English experience, are needed all over the world. Take your pick! Your first step is to click this link to learn more about the program. If you are at minimum just slightly curious about living overseas or teaching English abroad, I highly recommend you delve a little further. You've got nothing to lose! "It was the best decision of my life." International TEFL Academy also helps its graduates with post-certification job placement and recruitment. I was interested in teaching in South Korea, so International TEFL Academy hooked me up with Educon, a recruiter for EPIK (English Program in South Korea, a public school teaching program). Educon was incredible. They helped organize all of my documentation (visa application, FBI background check deadlines, tax forms, etc) that I needed to successfully submit my application. They kept me on task with deadlines and prepared me for my online Skype interview with EPIK. Throughout the process, I felt safe, confident, and far more relaxed than if I'd done any of this on my own. And, surprisingly, they did this all for free! I can't recommend working with a recruiter enough. I think the paperwork aspect of working abroad is the most difficult part. With a recruiter helping you along the way, it makes the whole process so much easier. Visas, especially work visas, send chills down my spine. They're usually such a hassle and can tempt you into forgetting the whole venture in the first place. But, if you work with a recruiter I guarantee this headache will diminish. My work visa for South Korea was one of the easiest visas I've obtained in all my time traveling. Work with a recruiter and submit your documentation way before the deadline. Not only will this take a load off your mind, an early submission may guarantee you a more preferable spot within the country you are looking to head to. This type of thing cannot be done last minute. If you secure a job teaching English in South Korea, either through the public school program or a private school, your housing will be paid for. You do not need to find your own housing. Not only that, your flights there and back will also be paid for. You will only need to pay the utilities for your apartment and your housing area/type depends on whichever your school decides. My school was incredible and placed me in the modern, bustling downtown of my city. I woke up to a view from the 16th floor everyday. You will initially have to pay for your flight and your school will reimburse you upon your first paycheck. If you do not have the money to make it out to South Korea (appx. $1,200 USD, one way), more than likely your recruiting company will loan you the flight money and your school will, in turn, pay back the recruiter. This was Educon's policy. 5) On to your new adventure! Pack your bags, grab your passport, open your heart, and prepare for a life-changing experience. I'd typically follow up by saying "Don't look back", but this isn't the case. Look back! Look forward! Look all around you! This is your time to make it happen. Take it all in. Do it. Throw regret by the wayside and fulfill your dream of living abroad. I'm scared. What if I don't make any friends? Making friends in an expat community is as easy as ...raising your hand and saying "Hi, I'm an expat." I like to think that anyone who finds themselves pursuing a life abroad voluntarily has a little adventure in them, and this characteristic and fish-out-of-water mentality, quickly turns everyone into fast friends and life-long confidantes and companions. I'll be the first person to single out my introvert tendencies. But. I've made so many important and life-long friends through travel and living in Korea that I've amazed even myself. I am better for having met them and they all continue to inspire and better my life. 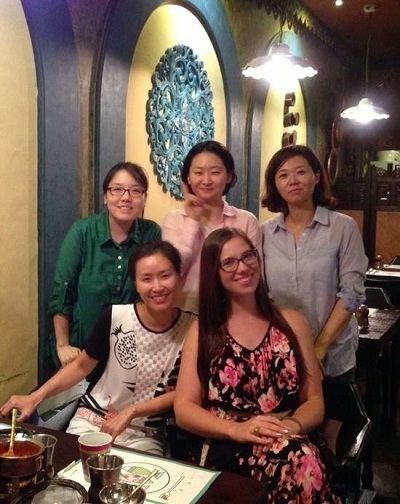 Not only is there a large expat community, but Korean people are generally sweet, friendly, and are just as curious about your culture and customs as you are of theirs. My past coworkers are now my life long friends and we email back and forth regularly to this day. I also had the incredible gift of growing especially close to one of my coworkers and her family. They treated me...well, like family, and made my time in Korea exponentially more rewarding and beautiful. There was a time, 5-10 years back, that being a picky eater in South Korea would be a death sentence. It's true that South Korea is a pretty homogeneous society and their food definitely follows suit. But, more and more food options are finding their ways into the cities and you'll be hard-pressed not to find a Western style restaurant or pizzeria in your local bar area. Hometown cravings are becoming easier and easier to curb. But. I do encourage you to try the food. Try it! The quickest way to get to know a culture is by taking a big bite out of it. Not only will your palette grow but you'll also be showing respect to the new culture you've found yourself in. Food to South Koreans is a big deal, and sharing food communally is a tradition. Dive in and work those chopsticks! Didn't you miss home? What if I get home sick? Homesickness is a reality; this it true. But new friends and new experiences do soften the blow. And, if you absolutely can't bear to be away any longer, more than likely your new paycheck will be more than able to take you home for a visit during you school's vacation time. I lived in South Korea for a little over two years and I was able to go home twice to see family. Don't worry! 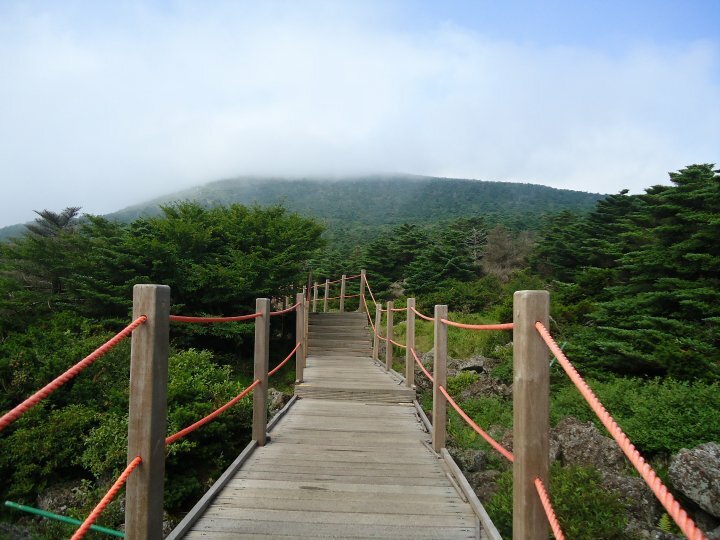 South Korea is the best option for any first time teaching abroad. The benefits and salary outweigh any other country looking to recruit English teachers at the moment. Your flights (in and out), your housing, and your medical insurance are all covered. Plus your salary, pensions, and contract bonus secure you with enough cash to save, travel, or do a bit of both. Not only does your job provide you with a great standard of living, the country does as well. South Korea is a very safe and friendly country. Of course, as with any place, use common sense, etc. But overall, South Korea has the lowest crime rate of any other country falling within its economic status. Back to travel... South Korea is an excellent jumping off point to traveling Asia. You're hours away from eating green curry in Bangkok and minutes away from chowing sushi in Japan. Not only are the international travel possibilities there, travel within the country is cheap and easy. South Korea has a fast, efficient, and foreigner-friendly rail system that connects most of the country. 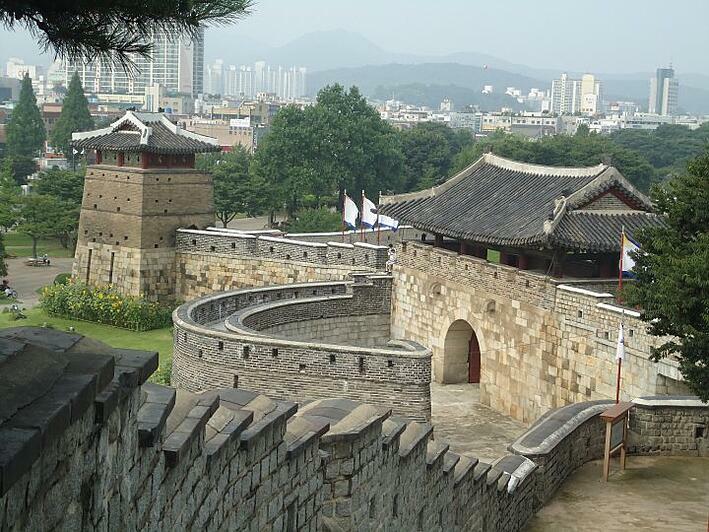 Fancy a weekend in Seoul, one of the world's most happening cities? It's only a 45min train ride away~ Get to it! Contracts in South Korea are typically 'year long'. You can opt out and break your contract if you really want to but you will lose all of your benefits that come with fulfilling your contract. It is possible, but it isn't ideal. It's only a year of your life! Stick it out! You'll only learn more about yourself, the culture, and being abroad if you do. Sure, I went through some rough times while being an expat, but I've no doubt grown from them. And I'd do it again in a heart beat. Saving Money: I walked away from teaching with over $10,000 USD to my name. That excludes all the traveling. Boom. The People You Meet: I now have best friends from all over the world, and an incredible man by my side. 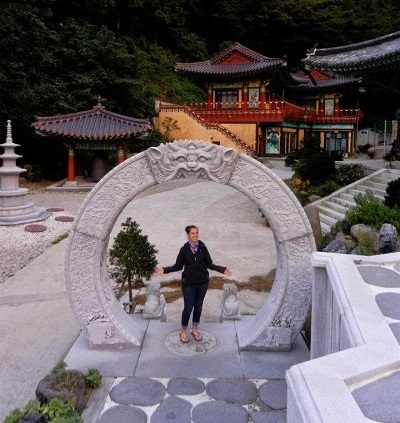 The Adventure: Like I said, I lived and taught in South Korea for two years. It's safe to say that it's been the best decision of my life thus far. It opened me up to an entire new world of opportunities and a life style that I'd only ever dreamed about previously. 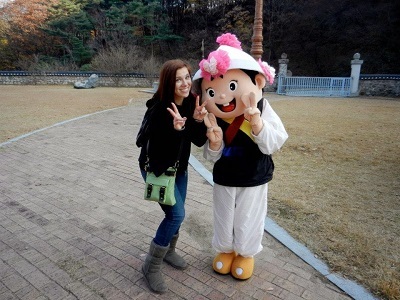 Want to learn more about Jessica's adventures teaching English in South Korea?